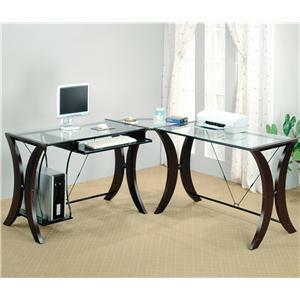 The Division L-Shape Computer Desk Unit by Coaster is available in the area from FMG - Local Home Furnishing. Create a home office or study that features a stunning style with functional designs. The Division collection includes a table desk and an L-shape computer desk, giving you the opportunity to pick the right piece for your space. Rich cappuccino legs with X-like designs compliment the chic glass tops, while CPU stands and keyboard trays provide practicality. This home office group will bring a casual contemporary appeal to your workspace that will allow you to stay productive. The Division collection is a great option if you are looking for Contemporary furniture in the area. Finish Bathed in a cappuccino finish. Case Detail Clean defined edges and cappuccino legs in an X design. Description: Top Smooth glass tops.